On a frosty January morning, the 4th of January to be precise, I was in the Alpine Ridge parking lot just below Gunstock Mountain in Gilford, NH. I was there to capture a helicopter lifting new communications gear to the top of adjacent Belknap Mountain. It was well worth freezing my feet off. 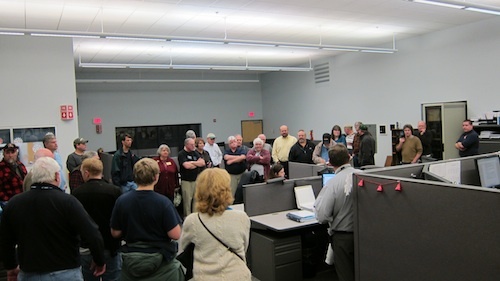 On Tuesday, December 4th, thirty-five members of the Central New Hampshire Amateur Radio Club (CNHARC) toured the state-of-the-art 911 and Lakes Region Mutual Fire Aid Communications centers in Laconia, NH. Both facilities are housed in nondescript buildings at the former state prison just north of Laconia. The evening started off with a fact session about the 911 center presented by Dave Rivers, the Chief of Operations. His many years of service helped hone his wry sense of humor. You had to really be on your toes to catch all of the zingers that were interlaced with amazing statistics and anecdotes about incoming calls to the center. The New Hampshire 911 Laconia facility Public Safety Answering Point (PSAP) is one of only two 911 call centers in the state of New Hampshire. The primary PSAP is in the state capitol down in Concord, however, both centers are equipped to handle calls from any location in the state. If all the operators at one center are busy, incoming 911 calls are routed to the other center. The 911 operator sitting in the center of the photo was coaching the caller in how to perform CPR. The highly trained operators use standardized protocols to handle calls. There are over 30 different protocols that range from animal bites to traumatic injuries. These step-by-step question protocols are built into the software that runs on the center’s computers. This methodology is time tested and allows the operators to focus on the most important aspects of each call. While the tour was in progress, the on-duty operators were busy helping citizens in need. One operator was coaching a caller in how to perform CPR. Club members in the room immediately picked up on the seriousness of the call and the room quickly filled with anxiety over what might happen next. It was so quiet in the room, you could hear a flea burp. Club member Chris Reynolds, KB1VXD, a dispatcher employed at the Lakes Region Mutual Fire Aid Communications Center, was kind enough to arrange the tours. He worked in conjunction with Cliff Dickinson, N1RCQ to facilitate this meeting. Cliff is the club program co-ordinator. Once we were finished with the tour of the 911 center, the group was split into two parts so we could visit the smaller Lakes Region Mutual Fire Aid Communications Center. This facility serves 35 agencies in the Lakes Region. If a fire, emergency, or EMT/ambulance call comes into the 911 center that would be handled by any of the fire departments that are part of the mutual aid group, they are transferred seamlessly to the trained dispatchers in the mutual fire aid communications center. The Lakes Region Mutual Fire Aid Communications Center handles about 70 incoming calls in a regular 24-hour period, but in severe weather events, that call volume can jump to several hundred calls per day. 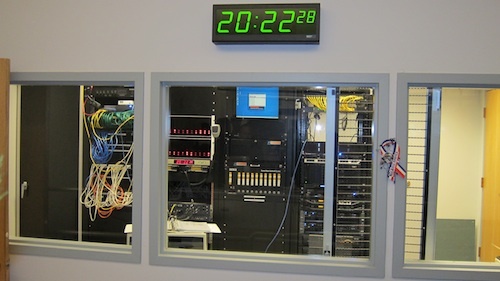 Both communications centers are highly computerized and have built-in redundancy. The employees that staff the centers are highly trained and are cool under pressure. This is the computer center for the Lakes Region Mutual Fire Aid Comm Center. Both tours were extremely informative, and probably no club member regretted navigating through the pea-soup fog to attend this one-of-a-kind meeting.